Planning to apply to a graduate program in social work? 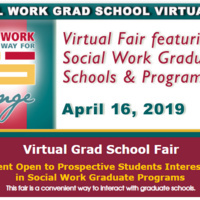 You are invited to attend the Social Work Grad School Virtual Fair on April 16. The virtual fair will allow you to have your admissions questions answered by representatives from graduate institutions nationwide in this live event.